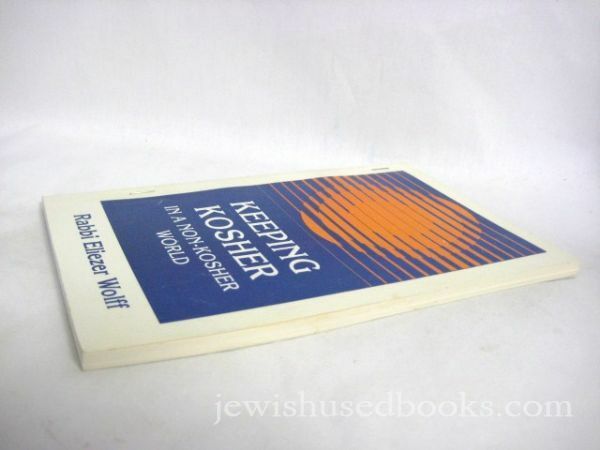 Rabbi Eliezer Wolff wrote this for a general Jewish Orthodox audience. The book is slightly dated but all the concepts are richly educational. The topics covered are concise but extensive enough to cover almost every problem or question you might come across. 1 Drinking coffee in a non-kosher restaurant. 2,3 Eating in a vegetarian restaurant. 4 Buying fish in non-kosher fish stores. 5,6 Buying fruit and juice in non-kosher stores. 7-10 Laws pertaining to a dishwasher. 11-13 Laws pertaining to a stove top. 14-17 Laws pertaining to an oven. 18-20 Laws pertaining to microwave ovens. 21-22 Laws concerning Cholov Yisroel. 23-25 Bread baked by Jews and non-Jews. 26 Using and kashering a toaster. 27 Cheese made by non-Jews. 28-30 Food cooked by non-Jews. 31 A non-Jew working in the kitchen. 36-39 Laws concerning dipping utensils in a mikveh. 40-41 Laws concerning buying kosher meat. 42-43 Foods requiring Rabbinic supervision. 44 Definition of ‘glatt kosher’. What is Glatt Kosher mean? 45 Laws concerning old and new flour.